Something Must Be Done About Prince Edward County is part history, part memoir. Written by Kristen Green, who was raised in Prince Edward County, Virginia, and attended Prince Edward Academy (a private school that did not accept black students until the 1980s--yes, you read that right, 80s). Green started poking around her town's local history and was startled to learn not only that her county protested desegregation by closing schools to all children (and using state funds for education to support the founding of Prince Edward Academy), but that her family was intimately involved in the fight against desegregation. It's an eye-opening read, to say the least. Robin Talley's Lies We Tell Ourselves, a YA novel, comes at the same subject from a very different angle. 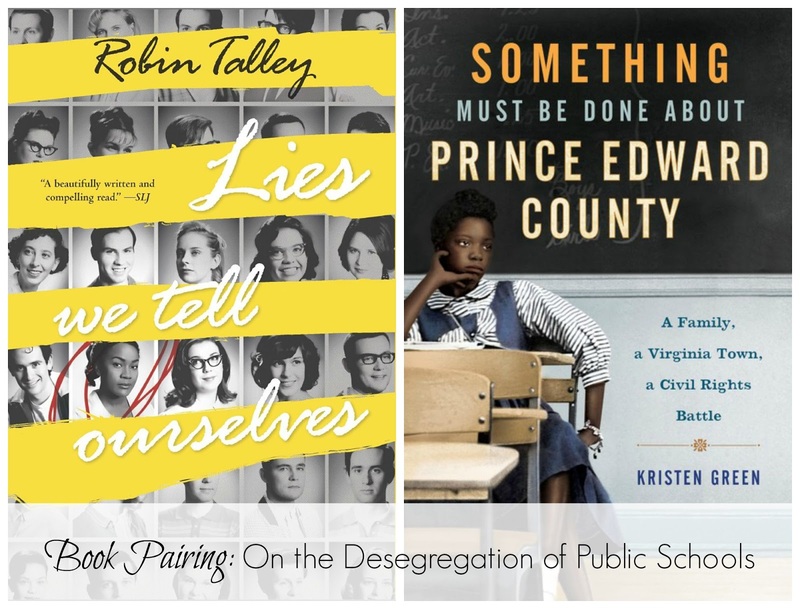 The novel centers on two girls on opposite sides of the desegregation fight in Virginia: Sarah, one of the first black students to attend Jefferson High, and Linda, one of the most popular girls at school and daughter of the town's strongest opponent of desegregation. The two girls are assigned to work on a group project, and are startled to find their time spent working together leads to a kind of friendship--or perhaps something more. Talley explores the ins and outs of high school drama skillfully, but even more so, brings a very human, very personal story to the desegregation battles in public schools, depicting the horrors and trials Sarah--and her sister and friends--were subject to as the first black students at an all-white school. Individually, both books are excellent. Taken together, they highlight different aspects of the same subject, exploring the shameful history of segregation in America. I'm a native Virginian, so I feel like I need to read these! I had no idea about the Prince Edward County story until this book came out. Also - is Jefferson Thomas Jefferson High School in Richmond? If so, that is the high school in the district where I grew up. Something Must Be Done About Prince Edward County is on my TBR list, but Lies We Tell Ourselves wasn't on my radar - so glad to hear about it! I've been reading a lot of non-fiction social justice books lately, which have been excellent (and harrowing), but I think switching up a bit and reading a novel exploring these issues would be a nice change of pace. Cannot WAIT to read Lies We Tell Ourselves. I've read a few articles/interviews about the author, and I love everything she says about this book and her process of writing it. Yes yes, definitely you do! (Also just because they are good books, IMO.) I already had to return the book to the library, but I think the Jefferson High in the book is meant to be fictional (though based on things that happened in real schools). Same here on the non-fic social justice books (mostly for work, but not all). I didn't even realize Lies We Tell Ourselves was on the same subject (I picked it up because the author was coming to town for a We Need Diverse Books event, which I then couldn't make it to anyway) until I started it. But it proved a really interesting way to engage a different part of my brain and reading around the same topic.